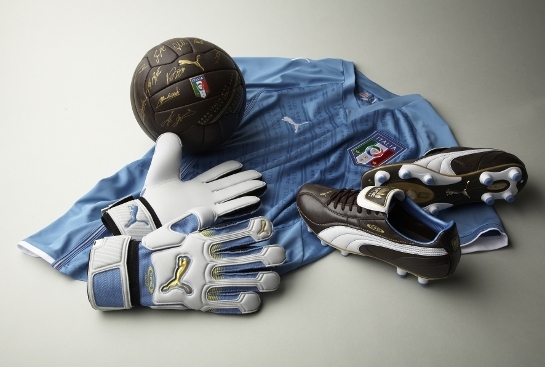 In addition to the brand new King XL Italia football boots, Puma has released an entire collection which pays homage to Italian football ingeneral and in particular to their double World Cup winning coach Vittorio Pozzo. As any Italian football fan will tell you, blue isn’t just a colour, it’s a state of mind. So naturally enough, colour is the most distinct feature on the new Italy kit which they will wear exclusively in the Confederations Cup (one the tournament is over, they’ll revert to their current strip). The new shade is called Cendre Blue and reflects the colour worn by Pozzo’s men through their successful years in the 1930’s. The oversized badge is also inspired by the Pozzo era. 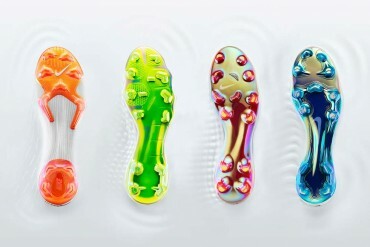 The King Italia Ball merges Italy’s illustrious football past with its glorious present. The ball’s heritage-inspired design, hand-sewn craftsmanship, and real leather casing, harkens back to Italy’s World Cup glory days in 1934 and 1938. 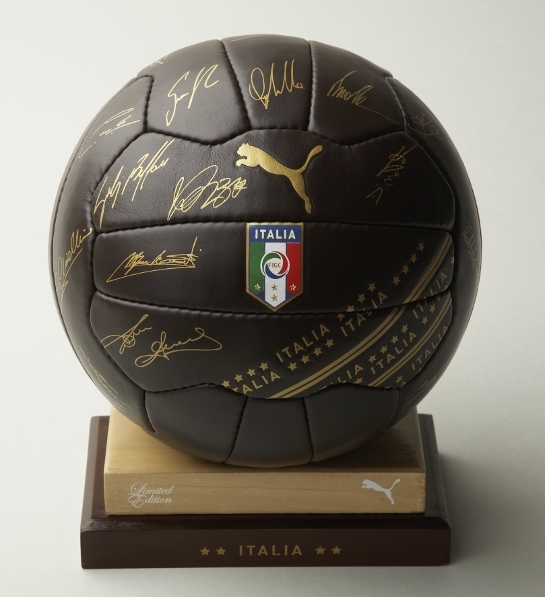 The ball also features the gold foil signatures of the 2008/2009 Italian national team players, making it a collector’s item for true fans of the Azzurri. A wooden display and specially designed ball bag are also included. The display pedestal features the Puma Cat logo, as well as four gold stars to commemorate the Azzurri’s four World Championships. 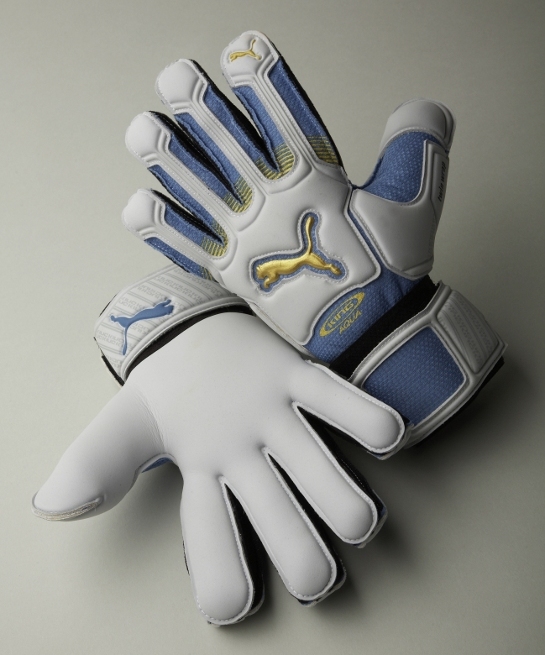 Designed to be worn during the Confederations Cup in South Africa, the King XL Aqua glove provides unrivalled grip in wet conditions and absorbs impact from the fiercest shots, thanks to its Speed Response Aqua Latex palm. The Twin Wrap Thumb and Control Wrap Technology maximize the latex-to-ball contact areas, while the Anatomically Spread tooling follows the hand’s natural shape and contours for total comfort. 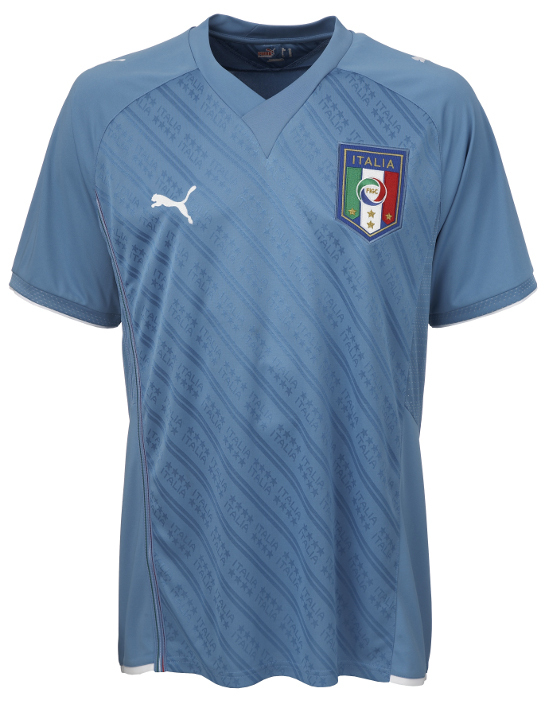 The Cendre blue colour on the backhand complements the Italian national team shirt.